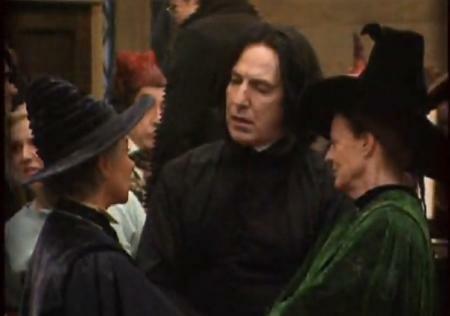 Severus : "So, Rolanda, would you like to go out with me then ?" Rolanda : "Are you kidding me ?!" Minerva : "No, he isn't, my dear. He's desperate to find a date for the next ball at You-Know-Who's ! He just asked me out and I said no, of course." Severus:"Is that so?...and how long exactly can you hold that position?" LOL nene72 your a mess, but it's so hard not have the mind wonder in that direction. Directly south of the belt. Especially with a fine specimen of man like that.